Origin and Habitat: Santa Cruz, Bolivia, Western South America, Southern America. Type Locality: Bolivia: Santa Cruz, Chiquitos, “near the Cerro San Miserato” [ Montana Divi Miserato], 900 m.
Habitat and ecology: Borzicactus samaipatanus var. divi-miseratus grows together with Frailea chiquitana in a vey restricted area near the Cerro San Miserato. Description: Borzicactus samaipatanus var. divi-miseratus ['divimiseratus'] is one of the morphological or local forms of Cleistocactus samaipatanus distinguished for slightly stouter and more erect stems, dark-greyish, bristly, breakable spines and slightly longer flowers up to 6 cm long. However it is hard to name it accurately without knowing where it comes from, and the two plants are not readily distinguishable, if not for the geographical provenance. More likely they are one and the same species. Stem: Columnar tapered toward the point, slightly branched near the base, 40-70 cm high, forming loose groups. Ribs: About 15, very low. Areoles: 3-4 mm apart, 3 mm in diameter, bulged, above with light brown hairs, below with greyish hairs. Spines: 13-18, at first reddish or yellowish, becoming grey-blackish as they ages, spreading downward from the bottom of the areola, needle-shaped, very thin, intertwined, unequal and brittle. Flowers: Numerous, at the apex of shoots, red, longer than the type, about 6 cm long. 4) Backeberg C. “Die Cactaceae” 11: 1959, p 973. Cultivation and Propagation: Borzicactus samaipatanus var. 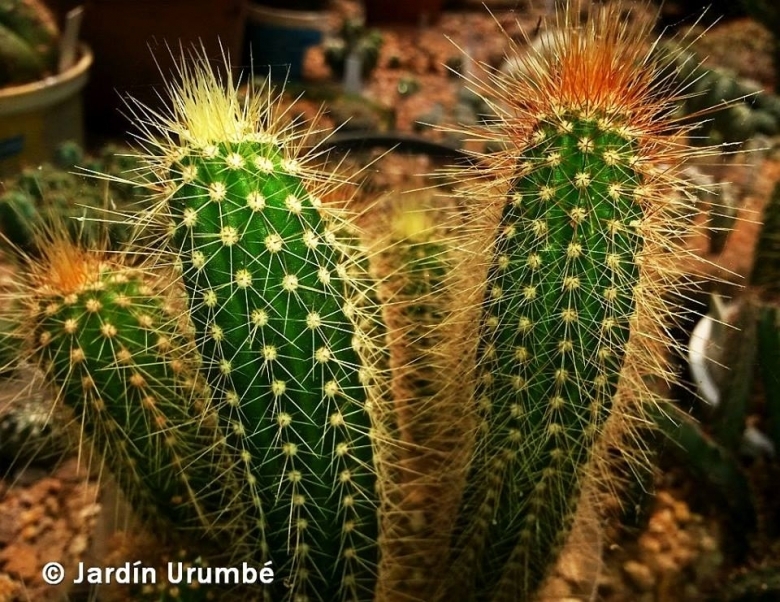 divi-miseratus is of easy culture, which makes it a good cactus for beginners.